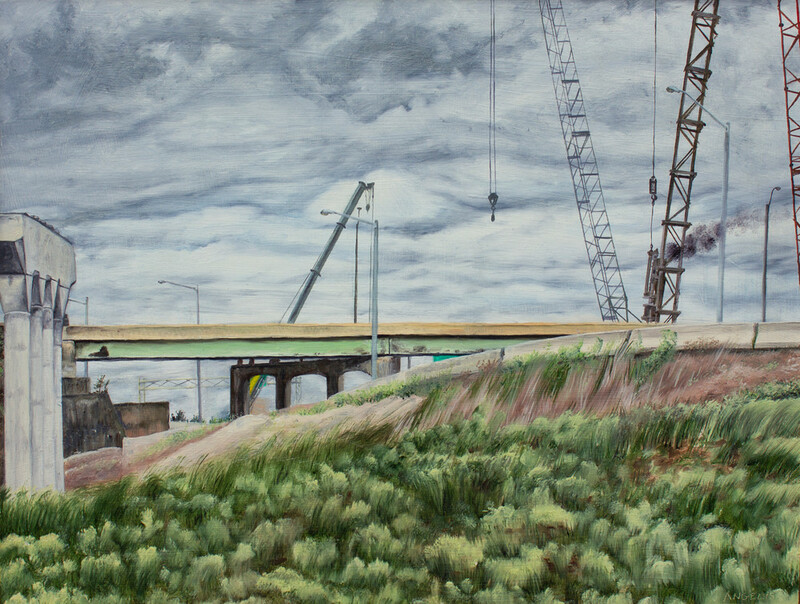 Oil on panel plein air painting of a construction site. I made this piece on a cool cloudy day near one of the sites where new footings were being placed for the highway superstructure. The process involved drilling deep holes, then driving several vertical pieces of concrete into the hole, each one at least 60 feet long. Several of these long pieces would abut each other, making a solid platform to then build the structural forms that would hold up the i-beams of the highway. The diesel hammer is a pneumatic diesel-powered battering ram about the size of a train engine. This spot was great, as I could see various stages of construction at once.